This nice plot of land is beautifully wooded and offers access to two quiet and green streets. This prestigious and popular area of La Hulpe, you will implement the house of your dreams in a privileged setting while having access to all facilities on foot or almost. The train station is 500 meters away, the center of La Hulpe at 1km and the E411 at 2km. Best of all, the south-west back orientation is ideal. Do not hesitate to contact us for any further information and / or prescriptions. This beautiful sloping ground offers you, in addition to an impregnable view, a calm and rustic situation while remaining just a step away from the center of Virginal and its facilities. The urban planning prescriptions will leave the possibility for each one to implant there the house of his dreams. FREE FROM CONSTRUCTOR! Rare opportunity ..... This pretty corner lot is nestled in the heart of a recent residential and family development, close to the main access roads to Brussels, Tubize or Enghien. Its reasonable size of almost 6 ares allows the establishment of a beautiful villa 4 fronts, surrounded by a garden easy maintenance. Its angled location avoids troublesome vis-à-vis and enjoys a beautiful view towards the surrounding fields. Free from constructor! Magnificent project of three buildings of two floors (ground and first floor) located at the exit of Péruwelz close to the marina and enjoying easy access to the city center and the motorway. The file is complete and ready to build with planning permission obtained, impact study, study of soil and foundations, PEB study, plans and price offer for Norwegian low energy construction. TOO LATE ;o) SOLD with the full satisfaction of both parties! Located between the village of Tilly and Marbais, this beautiful triangular plot allows the establishment of a beautiful and spacious house 3 fronts surrounded by a easy maintenance garden. The village of Marbais offers local shops within a kilometer and the national 93, home to major retailers. The lines of communication are close and the Golf of La Bruyere is less than 5 kilometers. Free builder. Lot A (in yellow) on the plan. 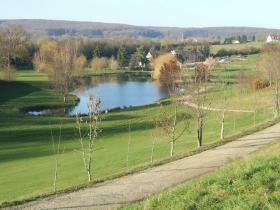 Beautiful building lots bordering fairways 15, 17 and 18 of the Bellême Saint Martin Golf course. Lots range from 650m² to 800m², starting at 50.000,-  permitting the construction of villas with 3 to 4 bedrooms. At the heart of the Natural Park of the Perche, located at the top of a small spur and adjacent to one of the most beautiful forests in France, Bellême is probably the most elegant and best preserved historical capitals of Lower Normandy. More properties in Bellême on www.BestPartner.be heading "Foreign countries".